Welcome to the PizzaExpress complaints department brought to you by HissingKitty. Experienced poor customer service? We make it easy to file a formal complaint against PizzaExpress online. Simply use our free form and your feedback will be instantly forwarded for review. Need to contact the PizzaExpress corporate office? We have the mailing address, phone number, and email address listed below. When we walked in the chef was sitting out of the kitchen area,he was sitting next to the tills. While sitting there the chef scratched his head a number of times and then checked under his nails to see what he scratched off. He then went into the kitchen area and started looking at his mobile phone. He put his phone down and then he blew his nose.our order came through, he commenced with our order with his dirty hands. Could not believe what I was seeing.I called the waiter over,I told him what I witnessed and he told the chef to wash his hand and restart our food.nobody came over with any apology. I think this needs to be dealt with.Totally shocked by the chefs lack of hygiene.I await a response. Had to wait a very long time after ordering food, tables arriving after us received there food before us. Tried to order more drinks, waited 20 minutes for drinks then had to order them again. As they we're forgotten. Very poor service and I am not sure we will be back as customers of Pizza Express anytime soon. Booked restaurant for work night out....leaving party for colleague and 50th birthday celebration. A few of us choose this restaurant specifically add it caters for everyone, did and service usually good and 2 of us had Taste Cards so thought it would be value for money. Told on booking table for 11 of us that 2 of us had Taste Cards. When got to restaurant we were put in window area which was cold. Took an hour for food to arrive although restaurant was quiet initially. I was served a very burnt pizza which was changed once I had pointed it out. The main issue happened when paying. Despite having taste cards we did not get anywhere near the correct discount. 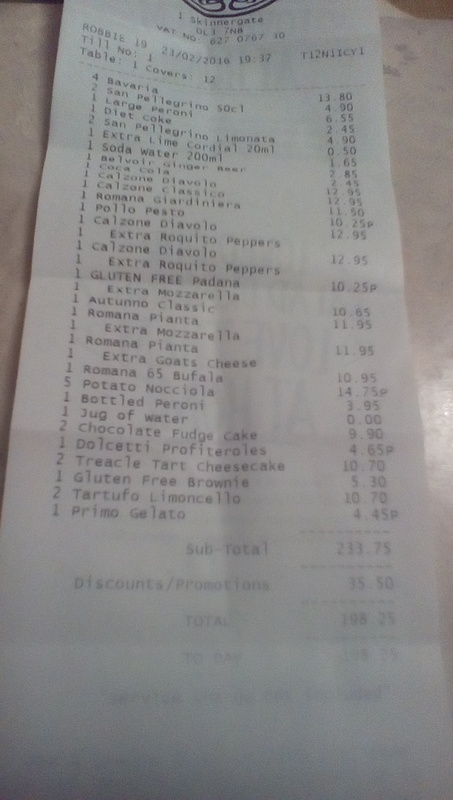 My friend had an offer of 50% off food bill. My card was 2 for 1. Either way neither card was honored. This made the evening very expensive for us. My manager and colleagues were unhappy and disappointed about the whole experience and I do not think they would return. I bought this taste card mainly add I am a huge fan of PE, add are my children. However, I am concerned about using this card again. Email said pick up in 30 minutes, I went when it said and they said it would be another 30 minutes. Horrible customer service! I went to visit Pizza Express earlier today for a takeout order. I have to say that I was extremely disappointed as I have in the past. When I brought the pizza home, I had only a slither of sauce on the pizza. There was so little sauce that I wasn't sure if there was any on there. It was horrible. I had many other problems with this particular store. Several times they had our orders wrong in the past. I've called them before and most of the time it's like talking to a brick wall. At times I was promised a credit because of the mess up but that never happened. I have wasted money in the past. I have basically given up on complaining to them. My roommate and I have been very frustrated. We have gotten burnt toppings, and sometimes hardly any cheese. We have ordered extra cheese, and still barely had any. These people are rude and simply just don't care. I am surprised that they still stay open. I apologize to complaining like this but I had nowhere else to turn. If you can contact me to resolve this problem, please contact me ASAP. This is my second time ordering from the PizzaExpress. Both times was an extremely long wait. Second time pizza was cold and the sausage pizza looked like a pie of just dough. Ordered a pizza and mini Apple pies was told silvery would be a hour and a half waited two and a half hours called and was told they were on their way waited 45 mins still no one called again a couple times and was told to wait 10 more mins the last time. I called talked to a different person and they talked over me and wouldn't let me say anything I told them I have been waiting over 3 and half hours. Was told the driver was I route five hours later still no delivery poor customer service and very rude as if I did something wrong will never order from them again.